America is facing a crisis of confidence. Our economy is broken, our neo-imperialistic foreign policy has proven an abject failure and our political system is for sale. In the meantime, one candidate’s focus on income and wealth inequality, and how to fix it, has given voice to those disaffected by the politics of the both major political parties. That candidate is Bernie Sanders. He is leading an anti-establishment insurgency within the Democratic Party. Such insurgencies are not new. Eugene McCarthy took on the party establishment in 1968 in opposition to the Vietnam War. Bill Clinton was the candidate from “Hope” in 1992. Howard Dean helped lead and anti-war insurgency in 2004 and later, as head of the DNC, championed the “50 state strategy” that paved the way for Barack Obama’s surprise victory in 2008. Sanders’ message of inequality is resonating in part because more people are living in poverty, wages are stagnating, workers are not seeing the benefits of economic growth, and even young people coming out of college are saddled with huge debt and challenged to find decent paying jobs. 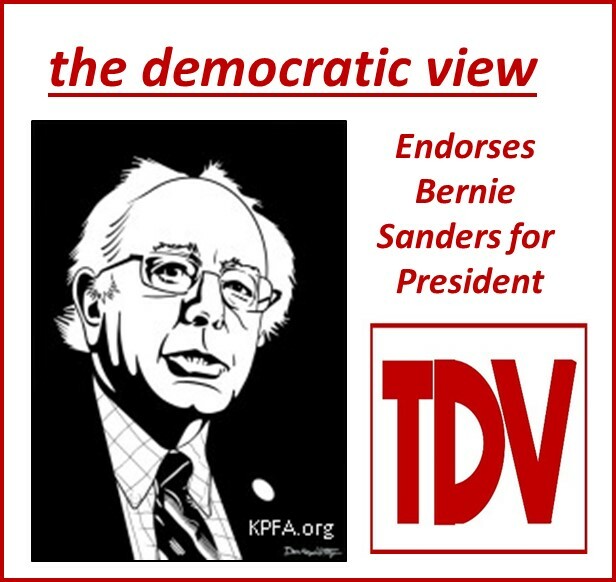 Sanders has been unequivocal in his commitment to help the poor and struggling middle class. He has been a leader in the growing movement to repeal Citizens United, the 2011 Supreme Court decision that opened the floodgates to “dark money” in politics, as well as reinstate Glass-Steagall and break up the big banks. His proposals for universal health care and tuition-free public higher education are critical to rebuilding America’s middle class. The $15 minimum wage Sanders supports is essential to ensure that people who work full time and raise families should not have to live in poverty. And his opposition to the disastrous war in Iraq and argument that the fight against radical Islamic terrorism should be waged on the ground primarily by Arab nations – with the U.S. and other nations lending support – is just plain common sense. It is true that a Republican administration in 2017 would be an unmitigated disaster. The racist bombast, xenophobia, and jingoism of the Republican Party currently on display is downright scary. But history has shown that nominating the “candidate that can win” often backfires. Establishment candidates—like Hubert Humphrey in 1968, Al Gore in 2000, and John Kerry in 2004 — do not appeal to the general electorate because they don’t generate the kind of excitement needed to get people to the polls. Outsiders—like Bill Clinton and Barack Obama—did well because they motivated voters with a clear alternative to run-of-the-mill, establishment politics. People don’t want more of the same. They want someone who will stand up and fix the deep rooted economic problems this country faces. Sanders has shown real leadership in clearly articulating the problems and offering workable solutions. Clinton, on the other hand, has already begun to cave on core principles and the general election hasn’t even started. She says she can “get the job done,” but what is the job exactly? She doesn’t support progressive taxation; she wants to raise the minimum wage to $12 instead of $15; she does not support reinstatement of Glass-Steagall to regulate the big banks, and her proposed spending on infrastructure renewal is just a fraction of what is actually needed. Clinton talks a good line, but when you get down to it, her proposed solutions are half-hearted, lacking in principle and real conviction. Reasonable compromise is a good thing; caving into vested interests who contribute large sums to your “Super PAC” is not. All of which is to say, to my Democratic friends, worry not, Bernie Sanders will be a stronger general election candidate then Hillary Clinton. He has foresight, honesty and integrity and we believe the anti-establishment insurgency he is leading within the Democratic Party has the best chance to generate the excitement needed to win in the general election. This country desperately needs a leader and president who will stand up and fight for the poor and middle class against the growing influence of big money in politics. My hope is our vast group of American citizens of the lower and middle classes will listen to the words and thoughts of Bernie Sanders and understand that he really does represent their interests, and therefore, the interest of all of those of us in our America. If we want to survive as a strong nation in ways that no other great power before us has done, we have to act and work as a community.